Coral bookmaker - 80 years of experience and 1500 betting outlets. Coral bookmaker, which is in the bookmaking business since 1926, is based and licensed in the UK. Because of recent company mergings, Coral online now has the sister site of Eurobet, and both bookmakers are the brands of Gala Coral Group. Coral.co.uk's offer is directed mainly to the UK players who can expect broad coverage of British domestic sports. Ladbrokes and Gala Coral merger to create the gambling giant in July 2015. As far as Coral’s land based bookmaking business is concerned, it owns more than 1700 betting shops spread across the UK providing an easy access to betting outlets to all its customers. Additionally, in March 2010, Coral has launched new broadcasting service, Coral TV, which is available at their betting shops. The Milton Keynes-based Coral TV centre delivers two betting channels as well as one Sky channel, and aims to appeal mainly to British horseracing enthusiasts. One of the oldest UK bookmaker Coral is a multiple winner of various awards. In 2011, at the eGR Awards, this company received the title of the Best Mobile Perfomance. In the same year at the annual awards ceremony the Betview Awards bookmaker Coral was awarded in the categories Chain of the Year more than 20, Best Designed Outlet of the Year. In 2012 Gala Coral was entitled Silver Sponsor in accordance with The International Gaming Awards. Coral bookmaker was founded in 1926 by Joe Coral who had earlier operated betting pitches at greyhound courses. With the help of Tom Bradbury-Pratt, his dear friend who ran speedway meetings at different venues, Joe Coral set up lots of speedway and greyhound tracks together with on-course Coral betting points. Their bookmaking business proved to be very profitable for the years to come. More recently, in 1999 Coral joined forces with Eurobet, the first company to accept bets via the Internet, and in that way Coral Eurobet was born. In 2005, a deal was signed in which Gala Group acquired Coral Eurobet to form Gala Coral Group. At present, Gala Coral Group has a strong market position with a number of licensed betting offices (more than 1,600 offices with 17,000 employees in the UK), bingo clubs (170 Bingo Clubs) and casinos (31 Casino venues) and a high quality multimedia offer as well. In 2009, Gala Coral was ranked second of the 2009 Top Track 100 list, having more than £15 billion in wagers accepted. At Coral.co.uk emphasis is laid on the typically UK sports such as soccer, cricket, darts, greyhound and horse racing (fixed odds and tote betting). Most of these disciplines are covered by the Coral Radio Centre, both live commentaries and previews. 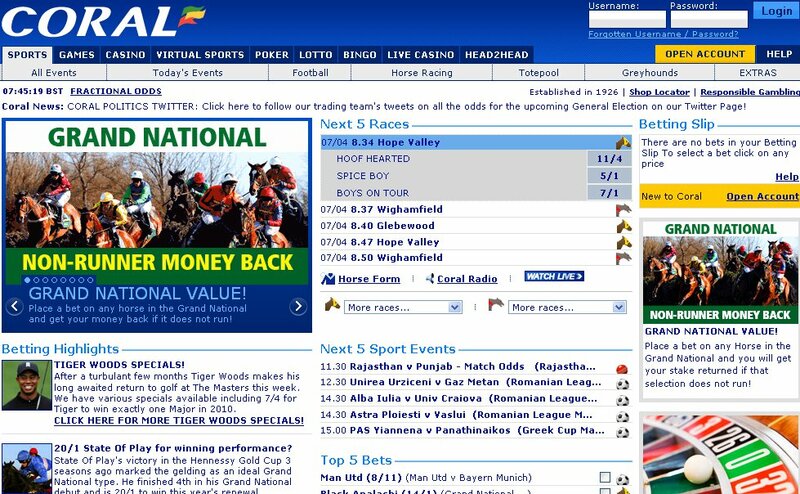 Additionally, the bookmaker offers virtual horse and greyhound races. Gala Coral is also the proud owner of two leading modern greyhound stadia Brighton & Hove Stadium and Romford Stadium. Coral.co.uk's gaming offer includes live casino, casino (e.g. 3 Reel Slots, 5 Reel Slots, Black Jack, Roulette, Card Games), games (divided into TV and Ent., Jackpot, Virtual Sports, Slots, Arcade), poker, lotto (e.g. Singapore lottery, German lottery, 49’s, Irish lottery or New York lottery), bingo and head-to-head games. 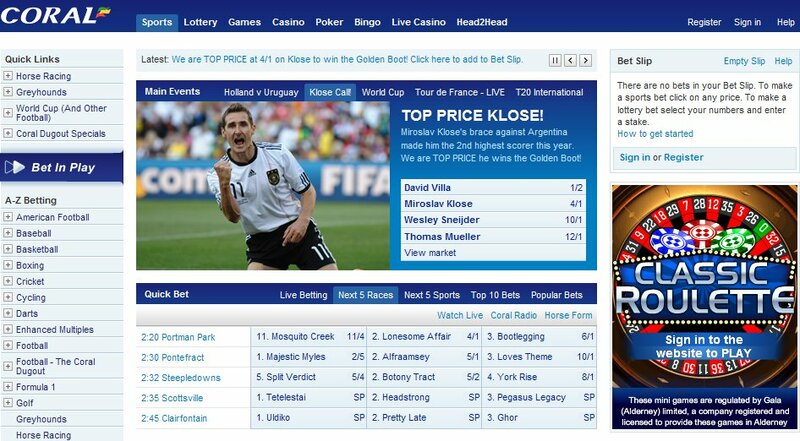 Throughout its long history the sportsbook can boast some achievements in the sponsorship activity. In 2009, Gala Coral was the main sponsor of Players Darts Championship, one of the most popular tournaments in darts. Moreover, the bookmaker Coral has become a major partner of the world-famous company Bloomberg Sports in the analysis of sports data. The company also supports dog racing, and owns numerous tracks. Max winning Varies according to sport/competition/game.